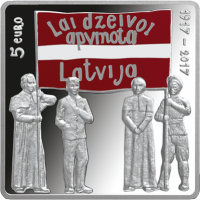 The obverse shows the representatives of various strata of society – participants of the Latgale Congress of Latvians, carrying a red-white-red poster calling for the unification of Latvia. The inscriptions "5 euro" and "1917–2017" are placed on the top left and right respectively. 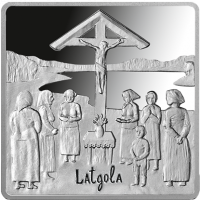 The reverse features women with children standing at the crucifix; the inscription "Latgola" is placed at the bottom.